Zilzar.com, the leading global Muslim lifestyle marketplace platform for information, content, community and trade to target the massive $2.5 trillion Muslim consumer market, was launched during the 10th World Islamic Economic Forum in Dubai recently. Zilzar is a business-to-business (B2B) and business-to-consumer (B2C) Muslim Lifestyle marketplace consisting of eight silos - $1.1 trillion halal food/beverage, $1.4 trillion Islamic finance, $224 billion clothing/fashion, $151 billion media/recreation, $137 billion travel/tourism, $70 billion pharmaceutical, $26 billion cosmetics and $15 billion logistics, based on 2012 capital expenditure. It will encompass 57 Muslim countries with population of two billion, plus the 100 million Muslim outside the Muslim world, all living in an external environment of rising per capital income, internet and mobile phone penetration and commerce, representing a growth opportunity, said a statement. 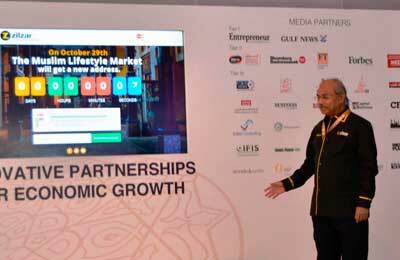 Zilzar will provide e-knowledge, information and content for users, sellers, buyers, and halal certification bodies, with e-souq, sellers will have free digital store-fronts. Its technology platform has been built using the most contemporary technology and usability standards like flat design and responsive layouts. Like leading social networks, the buyers and sellers can follow each other, making it the world's first trading social network. With a strong focus on mobile, Zilzar will provide trading apps to both buyers and sellers empowered with a real-time messaging solution for both. The messaging solution will be integrated with the seller's inventory allowing trade initiation from within the chat.